Recently, I have been noticing these advertisements on my morning and evening BART (Bay Area Mass Transit) commutes. 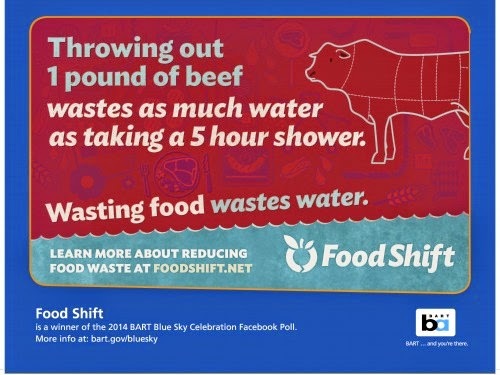 Food Shift, the organization responsible for these ads, is on a mission to eliminate food waste. Since California is currently experiencing a serious drought, these ads definitely caught my attention. That's a lot of water wasted! 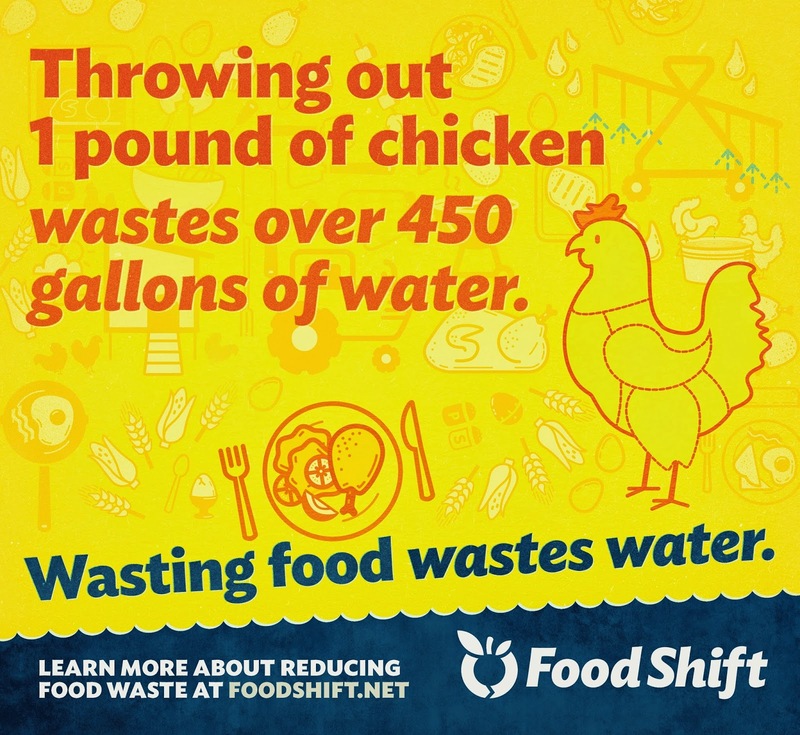 As I checked out Food Shift's website, I learned that wasting food has environmental, social, and financial impacts. According to Food Shift's website, that average American family of four throws out $1,600 of food each year, or 20 pounds of food per person per month. This got me thinking about how we can waste less food. Of course, Food Shift is interested in making changes at the systemic level of food supply chains, which has the potential to make a huge impact. At the same time, I think we can and should recognize that a lot of individuals making small changes can also make a difference. One thing we do in our household is to freeze items before they go bad. For example, when our fruit is getting on the over-ripe side, we freeze it for use in future smoothies. We also freeze a portion of our leftovers when we cook large batches of food, so that it does not go bad before we finish enough of it (or get bored of it). Food Shift has a list of recommendations on their site, such as planning ahead, keeping stock of your pantry (and using what you already have), and learning about proper food storage. What systemic changes do you think would decrease food waste? What personal steps do you take to waste less food?